Both selvan Kothandaram and his parents Thiru Venkatakrishnan and Thirumathi, also liked the profile photo and the details of Selvi Saranya. Both the families liked the details and background of the other and arranged the betrothal to fix the marriage. 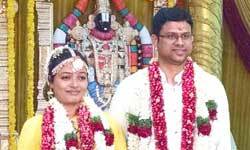 The marriage Selvan Kothandaram and Selvi Saranya, was held on 09/11/2014 at Palm Grove Hotel, Nungambakkam, Chennai with the blessings of the parents, relatives and friends. Kalyanamalai wishes the newly married couple to receive the best of everything in their married life.